The ocean’s web of life, environment and links to climate change involve complex issues and dependencies. While there’s still plenty to learn, we can act on what we do know now to help protect and extend the life of our oceans and support future generations. Opt for clothing made from natural vs synthetic fibers, especially polyester; wash synthetics less often. Avoid single-use plastic bags, bottles and other containers wherever possible. Carry reusable shopping bags, water bottles and utensils and support establishments that do not dispense disposable, single-use plastics. Urge companies in your country or state to phase out unnecessary and damaging plastics such as microbeads in personal products, single-use shopping bags. Organize or join petitions to policymakers to ban these products such as California and the European Union have been doing, or change policies to put more responsibility on producers for the waste they produce. 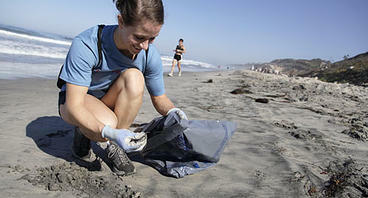 Get out and play on the ocean while collecting samples!! You can help researchers get more data on the problem by volunteering for the Adventurers and Conservationists for Science microplastics project. Organizations worldwide are committed to making a difference for our oceans, through research, conservation, education, community involvement and political action. While there are simply too many to list here, we’ve uncovered many of the best resources for finding marine organizations that are tackling the issues we face.